To pack, small children's school lunchbox is a daily challenge for every mom. 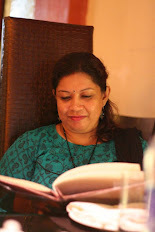 To pack a lunchbox, which is healthy as well as eye-catchy for them that too every morning, is a daunting task for me. Over that, their taste buds change very frequently. One thing they won't like for long time. To overcome this problem, every mom has to be a recipe inventing or collecting machine. 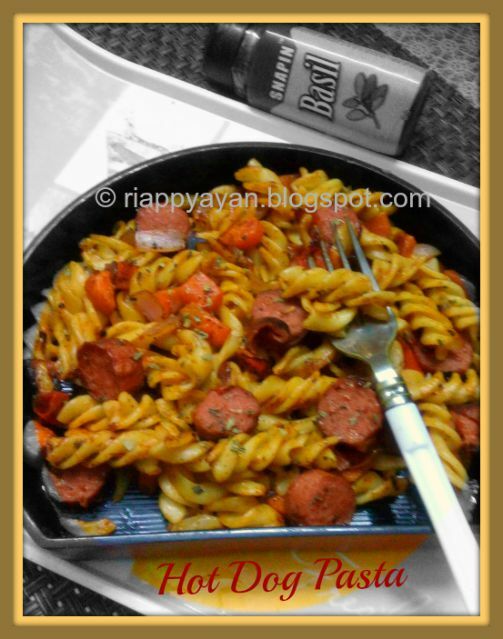 To all such moms, here is a healthy as well as delicious lunchbox recipe from me....Garlic flavoured Hot Dog Pasta. Hot Dogs are chicken sausages, available in various flavours in supermarkets. They are nothing but smoked minced chicken in cylindrical shape. They are already cooked. But hot-dogs and their packaging fluid are sometimes contaminated. So I always wash and put them in boiled water for 5 minutes. Then deep-fry them in oil until it gets brown from all sides. My kids love them. Vegetables : Carrot, red/green bell pepper, corn etc. Black Pepper : 1 tsp. Italian dried herbs(Basil, Rosemary) : 2 tsp. Cook any pasta in a pan with a drizzle of oil and a pinch of salt until done. Drain and keep aside. Make puree of 2 big tomatoes in a blender and set aside. Hot-dogs are always cooked before packaging. But hot-dogs and their packaging fluid are sometimes contaminated. So I always wash and put them in boiled water for 5 minutes. Then I cut them into pieces and fry them in oil until all of them get brown from all sides. Keep aside. In a pan, pour oil, fry all the vegetables until done and keep aside. In the same oil, fry onions for some time, then add crushed garlic and stir fry for 2 minutes. Then add tomato puree and chilli sauce, if you child can't tolerate chilli sauce, avoid it. 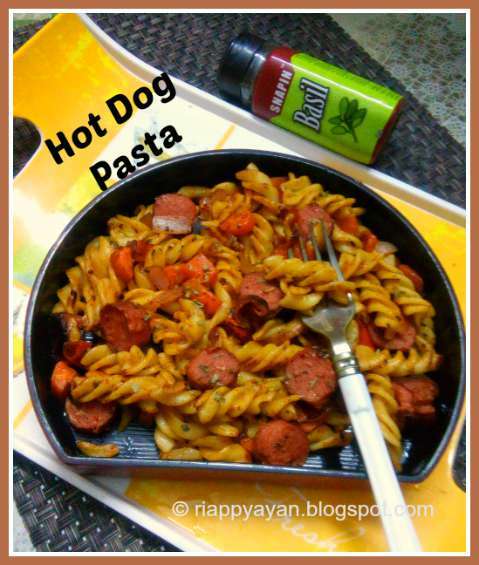 Mix finely, then add cooked pasta, vegetables and hot-dogs. Give it a good stir, add salt and black pepper to taste. Lastly add basil and rosemary. Mix everything together and you are done.